What is the Difference Between the Mazda CX-3, CX-5, and CX-9 SUVs? 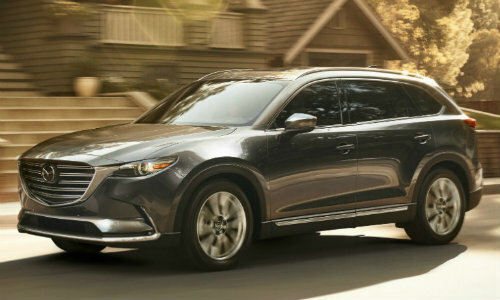 Home » Mazda CX-9 » What are the Differences Between the Mazda CX-3, CX-5, and CX-9 SUVs? What are the Differences Between the Mazda CX-3, CX-5, and CX-9 SUVs? Compact and midsize SUVs are a reliable compromise between vehicles. They offer more practicality in seating and storage space over sedans, yet still retain the respectable fuel economy and responsive handling not found in full-sized SUVs. Mazda has 3 SUV models within its catalog, expertly marketed and organized to show a clear advancement in size and power. These vehicles are the Mazda CX-3, the Mazda CX-5, and the Mazda CX-9. A straightforward look tells you a great deal as the Mazda CX-3 is the smallest model, the Mazda CX-9 is the largest, and the Mazda CX-5 is the middle child in-between. Still, that leaves many features and specifications untold. 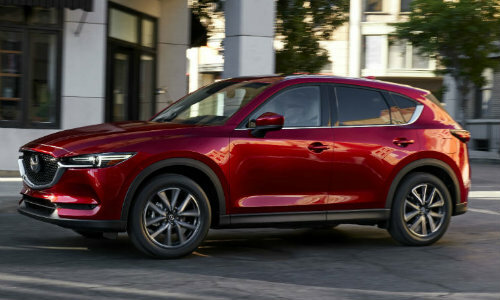 What are the specifics that each Mazda SUV offers in their unique model? 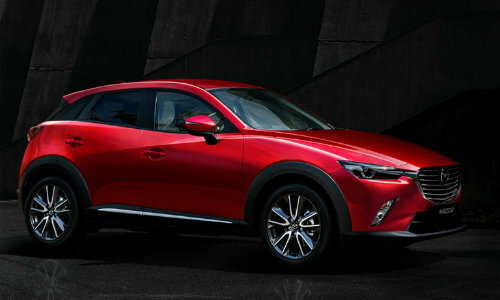 First up we have the smallest model, the 2018 Mazda CX-3. Because of its size, the Mazda CX-3 offers the best fuel economy among the Mazda SUVs with a combined city and highway MPG of 31. However, the Mazda CX-3’s size means it also is the lowest in terms of power, seating, and storage. Still, the 2018 Mazda CX-3 is a comfortable, sporty, and fun ride starting at $20,110. The newest of Mazda’s 2018 SUVs, the 2018 Mazda CX-5 is a triumph that doesn’t sit forgotten between the CX-3 and CX-9. Starting at $24,045, the 2018 Mazda CX-5 offers the same 5 passenger seating of the Mazda CX-3, but with much more room to stretch for a comfortable ride. The 2018 Mazda CX-5 also has a maximum cargo capacity of 59.6 cu. ft. compared to the Mazda CX-3’s 44.5 cu. ft. of space. Likewise, it also improves on power with an incredibly balanced 187 horsepower and 186 lb-ft of torque! The largest Mazda SUV, the 2018 Mazda CX-9 still offers a fuel economy that’s incredible for its size and included features. Its pull is increased up to an impressive 227 horsepower and 310 lb-ft of torque! Finally, the 2018 Mazda CX-9’s most striking feature over its brethren is its space. Seating is expanded to hold up to 7 passengers and the 2018 Mazda CX-9 comes with a maximum cargo capacity of 71.2 cu. ft.! The 2018 Mazda CX-9’s pricing starts at $32,130. What New Technology is in the 2017 Mazda CX-5? All of Mazda’s amazing SUV models are available for purchase now at Marketplace Mazda. You’ll also find the rest of Mazda’s award-winning catalog for sale, such as the popular 2018 Mazda3 and the stylish 2017 Mazda MX-5 Miata. If you’d like to learn more about the Mazda CX-3, Mazda CX-5, Mazda CX-9, or any other Mazda model, feel free to give us a call. Our sales team are able and ready to help you however needed. Soon, you could be driving off our lot with a new and fantastic Mazda vehicle! This entry was posted on Monday, December 11th, 2017 at 12:00 pm	and is filed under Mazda CX-3, Mazda CX-5, Mazda CX-9. You can follow any responses to this entry through the RSS 2.0 feed. You can skip to the end and leave a response. Pinging is currently not allowed.